Looking to register for an event or fundraiser? The Registration "Cannoneers Club" is not currently available. Cannoneers Sportsmens Club was formed in 1946. The idea of a local social club was started out by a bunch of guys playing on the same ball team and all were looking for a place after the game to hang out. Instead of hanging out in each others basements they formed the Cannoneers Sportsmens Club. With the plan of establishing a "home base" the Cannoneers felt if they could house and support there team, why couldn't they support other teams? That notion built and grew to spread many local sports teams both adult and youth and leading to the Cannoneers Club sponsoring 1000's of local athletes and teams in the community. 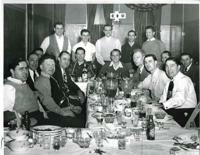 Each year since we originated in 1946 the club has grown and grown. Originally sponsoring mens softball leagues it has reached out and lent its support and sponsorship to many teams. One organization we have help organize, Cannoneers Youth Football and Cheer program, which plays in the Bux-Mont Association of the National Pop Warner Youth Football and Cheer. This organization started in 1964 and is still running strong for over 50 years!